READY TO SING YOUR HEART OUT? Join us Sunday afternoons! No choir experience necessary, just the ability to sing in tune and a sense of humor. 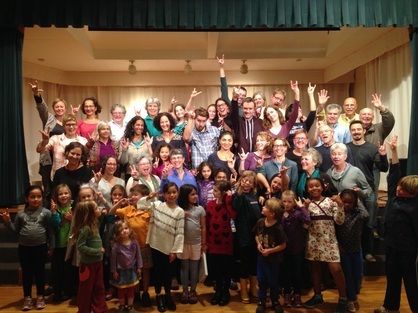 Our community is 90 singers strong and we're always looking to share the joy with new members. ALL ages welcome - seriously. If you know that Neighborhood Rocks is right for you, register! If you have questions after checking out this page, please contact us. Registration for Spring 2019 is open! Our seventh season starts Feb. 3rd. See the schedule below or click this button to register now. If you'd like to try us on for size, join us for a rehearsal. You can get a feel for our musical style, our community spirit, and our fun-loving approach to choir singing. Email us for our rehearsal address (just past Jamaica Pond in Brookline Village) and let us know you're coming! We're excited to take on songs about animals, the animal kingdom, and creatures of all sorts! Enjoy The Rolling Stones and James Taylor? Katy Perry and Ella Fitzgerald? So do we! ​Neighborhood Rocks sings awesome music in many genres - pop, rock, folk, jazz, and world music. If it's foot-tappin' or heart-string-pullin', we'll sing it! ​You'll love performing our song selections with our professional band during our concerts. Neighborhood Rocks is truly multi-generational and community oriented: we have families, singles, and couples; toddlers, kids, seniors, and everyone in between. Children of all ages are welcome (babies love it when mom and dad are rockin' out) and we have special classes for kids. Solo singers - it's a great place to make friends! Shower singers, radio-hum-alongers, and bedtime crooners unite - if you can carry a tune, you can sing with Neighborhood Rocks. We practice with sheet music, and give lots of help along the way for folks who don't read it. You get to sing fun music and learn a new language - it's a win/win. Plus, you get practice tracks to belt out with in the car, so you can take our music with you all season long. We want our choir to be financially accessible to anyone who wants to sing with us, so we use a TIERED DUES SYSTEM. We ask members to consider carefully, and make a payment decision that feels best for your household. Note: Tuition is not required for children under 3 years. Tier One: $150 adult/$100 child over 3 y.o. Tier Two: $200 adult/$125 child over 3 y.o. Tier Three: $250 adult/$150 child over 3 y.o. Any family that wants to join is welcome, even if you are undergoing financial hardship that prohibits you from paying in full. Financial aid is usually awarded in the amount of 50% or 75% of your household dues, based on Tier One pricing. Note: we do not require any legal financial documents in order to apply for aid. Krissy and Michael have been singing together since the first day they met in September 2003. Partners in life, music, and business, they created Neighborhood Rocks in 2016 with several years of community music-making in their back pockets. With "infectious" joy and heartfelt communication, Michael and Krissy both feel a real calling to work with folks who want music in their everyday lives and who want a sense of belonging to a local community. Neighborhood Rocks is your extended family! “I've been singing since I was a toddler. My Latvian grandmother would sing folk songs with me in the kitchen, waiting for the school bus, and swinging in the hammock. I loved to sing at Latvian Saturday school, where I learned that not only did I love music, but I was good at it! When I was 9, I took a trip with my mother to Latvia and saw the world-famous Song & Dance Festival, where 20,000 singers gave a 6 hour choir concert in an outdoor stadium. I was transfixed, and hooked on music for life. ​Fast forward through years of piano lessons, chorus, marching band, more chorus, orchestra, and the thrill of a lifetime singing at Carnegie Hall as a high school junior, and it was clear that I'd caught the Music Bug. More schooling followed (UMass Amherst, New England Conservatory, and Harvard Graduate School of Education), along with lots of teaching, conducting, and performing in the Greater Boston area, as well as in the Latvian-American community. “My music story is my life story, and it starts and ends with family, both mine and yours. I grew up in a house where music seemed to come out of the woodwork. My dad was a history teacher and drummer, my mom a dancer and somatic educator, and my two sisters and I all sang and played piano and other instruments. I grew up thinking it was completely normal for families of 5 to sing in harmony on car rides. As a little kid I used to come along to community theater and show choir rehearsals that my parents led, watching the action from the sidelines with my legs dangling off the edge of the stage. ​Once I started singing in choirs, I never stopped. From middle school through college and as an adult, I’ve never NOT been in a singing group. I love the sense of community, the bond of making music together with just our voices. One of my early highlights, and the first time I got a glimpse of my future, was being chosen by my collegiate a cappella group to lead them as music director for 2 and a half years.